Some gardeners suggest ways to increase sunlight in order to grow edibles in the shade, well, then you are not growing in the shade anymore. End of problem. Instead, you might want to learn how shade and edibles can coexist. Although certainly we can remove some tree limbs to increase sun exposure, we will still have the problem of extensive root systems sapping every bit of moisture from the surrounding soil. This makes it very difficult for smaller plants and edibles to compete. As shade producing trees grow ever larger, their root systems continue to displace valuable soil and consume nutrients. These conditions often make it impossible for all but the most tolerant of plants to thrive. A large building or high wall can also create difficulties for growing beyond the problem of shade. Air circulation may be prevented, which can cause heat buildup. Conversely in moist regions a lack of air circulation combined with deep shade may cause moisture to be trapped and soil to remain waterlogged. Not many of our edibles will thrive in such conditions. However, not all shade is created equal. Shade can be created by buildings large and small; fences of varying height can be solid or more open; large or small shrubs; narrow or wide evergreens. In other words there are vast varying degrees of shade that must be evaluated. The trick is to match your edibles to the amount and length of shade that is cast over the garden. Before selecting plants, monitor how the shade moves at different times of day. Perhaps the garden will receive a few hours of direct overhead sunlight. Or a few hours in the morning plus a few hours in the evening. Maybe the garden receives all day sun dappled by high overhead leaves. If you have had the opportunity to monitor available sunlight over a full season, perhaps you can grow edibles of varying needs. You may be able to grow cool season edibles where sunlight is available only very early and/or very late in the season. A plot that is shaded by a building until late spring or early summer may still support the needs of certain warm season edibles. Edibles that produce fruits or root crops generally require a good deal of sun exposure. 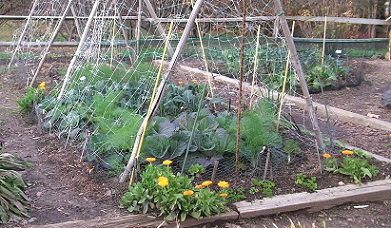 Those that we grow for their leaves or stems, such as herbs and greens, will often do just fine with limited sun, and usually lack any bitterness. And although the amount of sunlight that a plant receives often limits the bounty or size of the produce, it generally does not reduce the flavor. So, let’s get on with figuring out what we can grow where. Herbs - a few hours a day is all you need for chives, cilantro, certain marjoram, mint oregano and parsley. Kale - 3 to 4 hours of sun will produce small leaved plants. Lettuce - is made for the shade. It will bolt in the sun’s heat, so dappled all day or heavy shade mid day is ideal. Mesclun - the ideal shade garden crop. Only a couple of hours a day or all day dappled shade produces plenty of salad mix. Peas and Beans - generally prefer a good deal of sun, but will produce a reasonable crop if you have a long growing season with 4 to 5 hours of sun. Dwarf varieties will be most successful. Root Vegetables - at least 4 to 5 hours sun will be necessary and you will need a long growing season for beets, carrots, potatoes and radishes. If your season is shorter, well, then you are growing tender baby carrots and new potatoes! Spinach - 3 to 4 hours of sun is all you need, as spinach will bolt in full sun. Many other edibles will do quite well with less than full sun, but closer to 6 hours a day will be necessary for brussels sprouts, cabbage, cauliflower, celery, garlic and turnips. Don’t frustrate yourself trying to grow tomatoes, peppers and other full sun crops in part shade. It just isn’t going to work out anywhere near satisfactory. Be sure to monitor moisture carefully. Growing with root competition will require extra water as well as nutrients. Concrete can reflect sun and create heat and may increase the sunlight reaching your plants. Use bedding plants from a nursery or your own seedlings to get a head start on the growing season.